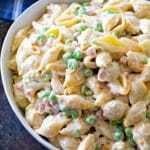 A Classic Macaroni Salad that is a hit at all my parties and BBQs with both kids and adults. It's quick, easy and delicious which makes it the perfect side dish. Make it for summer parties, 4th of July or a potluck! Boil shell macaroni according to directions. Drain, rinse with cold water and set aside. Mix together celery salt, onion salt, Mayonnaise, mustard, seasoning salt in large bowl. Add noodles, cheddar cheese, peas and ham. Mix well. Chill until serving.